Blue and white, the colors of the Salvadoran flag, and matter of great pride for its people, are represented well here in Sunset Park's Usuluteco. This is the demonym for someone from Usulután, the fifth largest city in the small Central American nation located in the country's southeast. Even the bricks on the facade have been given a coat of fresh blue paint, under the blue and white throwback awning advertising restaurant and country. Inside, the colors continue and mirrors enhance the size of this small-ish place. It is a working class restaurant through and through, the tablecloths are worn, and the tired faces glance up to the four televisions. During weekdays, the servers join the customers to watch telenovelas, while on weekends fútbol rules. 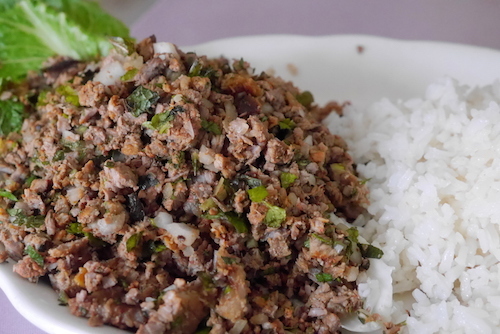 Salpicon ($10, below) is a salad with finely chopped steak, but really gets its oomph from the mixture of onions, chiles, pepper, and vinegar. Everyone has their own recipe, but you also find tomato, oregano, and avocado in their sometimes, often served with rice or as a topping for tostadas. El Salvador is the origin of the dish, but it has made it to its neighbors Honduras and Guatemala, as well as into Mexico. Don't forget to squeeze a lime over everything. 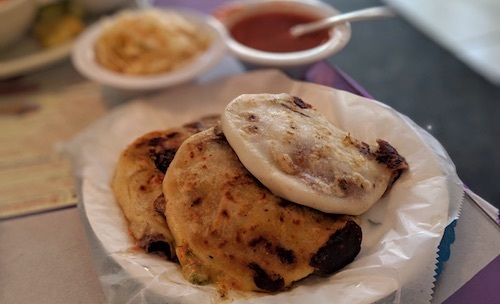 For many, Salvadoran food is all about the pupusas ($2.25 each, below), which come in standard varieties here and get the job done. The fermented cabbage relish (curtido) here is also standard, but should be applied liberally. I do notice the place has a decent amount of younger kids from the neighborhood come in for their cheap meals, as two of these could be enough to fill a smaller stomach. If you notice a difference in color above, that is because the top pupusa is made from rice flour instead of the normal corn. Often times Salvadoran restaurants can make these but do not advertise them on the menu, sort of a need-to-know basis for folks that might want them. They are worth trying if you have not before, a full shift in texture and flavor profiles. The rice is dense and chewy, but with a slightly sweet and more subtle flavor than corn, allowing the ingredients to shine through more. Make sure not to order more of the rice variety than you can eat at this sitting though, for they absolutely cannot be warmed up later. When they cool, they turn into dense undesirable discs and will have to be thrown away. Another thing you may not see on Central American restaurant menus but that is somehow always available (and delicious) is a plate like the one below. 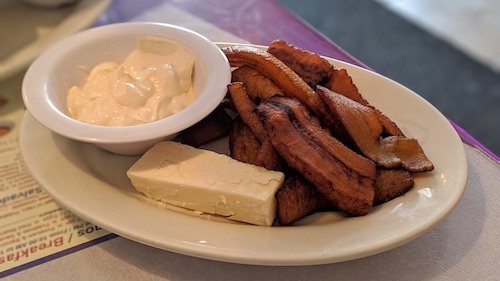 This combination of fried sweet plantains, cheese, and cream is a popular breakfast item in El Salvador and its neighboring countries. It is also a miraculous combination of all those necessary elements of deliciousness: salt, fat, acid, and heat. 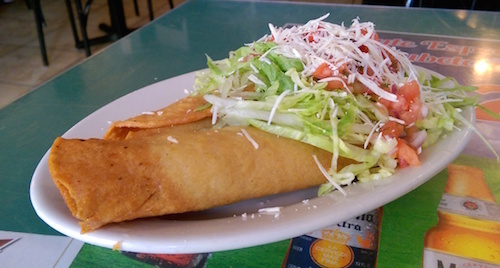 The chicken inside of the tacos dorados ($6 for two, below) is a dream, moist and so well spiced. A little too much iceberg lettuce adorns the top, but the cheese, tomatoes, and crispy shell (dorado means hard) make an excellent mixture of flavors and textures. 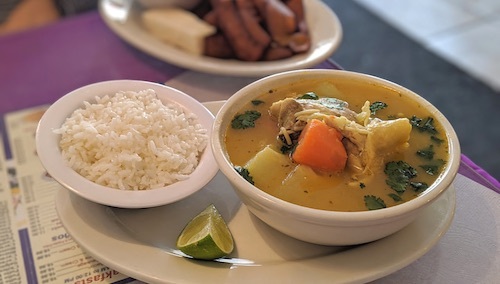 Sopa de pollo is usually around for lunch specials but can be ordered a la carte. 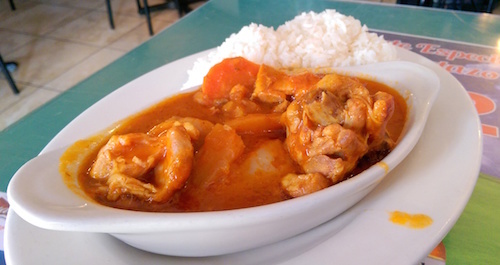 For another good chicken dish, try the simply titled pollo en salsa ($10, below), a boat of more good cuts of the meat in a bath of savory sauce. You have your choice of side dishes, but any dish like this deserves white rice, and I also chose the excellently meaty side of beans, highly recommended. The service here is a bit hit or miss. Notes from my first visit describe "nice staff" but another meal was served by a very uninterested young woman. The last visit was extremely pleasant again with no trouble. At any rate, a trip or two to the back bar to interrupt one of those telenovelas is probably happening regardless of the demeanor of the server on a given day, and pace can be a bit slow. So come prepared with your patience and have a nice time. Throw a couple coins in the jukebox, which obviously has its volume stuck on maximum.